Looking for a nifty Valentine’s Day gift, and tired of the same old same old flowers and chocolate malarkey? 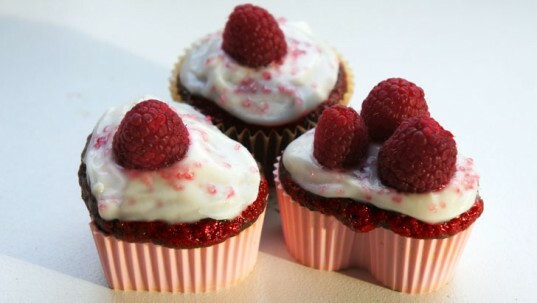 How about showing your special someone how much you care with a delicious batch of heart-shaped red velvet cupcakes? This vegan recipe for red velvet cupcakes uses organic, eco-friendly, and cruelty-free ingredients—so it’s as sweet on the planet as it is tasty, and it’s so easy to make that even a four year-old can do it! Watch the above video to see Inhabitots baker-in-training-pants, Petey Rojas, show you how to make vegan red velvet cupcakes. Read below to see the ingredient list and further details. 0. WATCH THE VIDEO ABOVE. 2. Line your cupcake tin with liners. We found our cute silicone heart-shaped liners at Whole Foods. 3. Whisk together the soy milk and vinegar and set aside to curdle. Put the flour, sugar, cocoa, baking powder, baking soda and salt into a large bowl and mix. Add the oil, then the food coloring, vanilla & almond extract into the soy milk and vinegar mix. Gently fold the wet ingredients into the dry ingredients, mixing until the large lumps disappear. 7. Fill the cupcake liners ? of the way full. The cupcakes will rise a lot – if you fill them too full, you’ll end up with deformed mushroom-shaped cupcakes! 8. Put in the oven and bake for 20 minutes. 9. When the cupcakes cool, frost them, decorate them and enjoy! Petey likes to make a yummy and easy vegan cream cheese made by mixing Tofutti cream cheese with Cherrybrook Kitchen’s vanilla frosting. We’ve topped our cupcakes with pink sugar sprinkles and strawberries and raspberries. Nice recipes for DIY from-scratch vegan frostings can be found in “Vegan Cupcakes Take Over The World” by Isa Chandra Moskowitz and Terry Hope Romero. Watch the video to see Kinderbaker Petey Rojas bake these cupcakes. They’re so easy a kindergartener can do it! 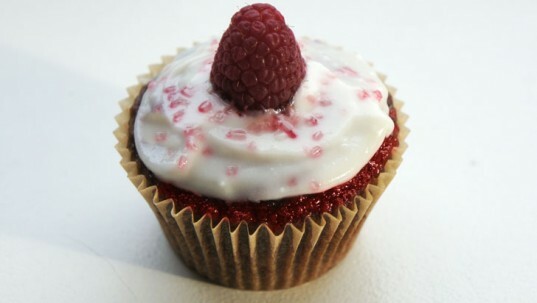 This recipe is from “Vegan Cupcakes Take Over The World” by Isa Chandra Moskowitz and Terry Hope Romero. If you enjoy this recipe, consider purchasing the book here. Those cupcakes look delicious and the recipe is so easy! Petey is the best baker! super cute and the cupcakes look amazing. i'll have to give this recipe a try! I will have to try this for my vegan sweeties! Thanks for the tips! This is one of the cutest videos I have ever seen. Petey needs his own show on The Food Network. Being from the South I have a real weakness for red velvet ANYTHING. These look delish! Yum!! I can't wait to try these! Looking for a nifty Valentine's Day gift, and tired of the same old same old flowers and chocolate malarkey? How about showing your special someone how much you care with a delicious batch of heart-shaped red velvet cupcakes? This vegan recipe for red velvet cupcakes uses organic, eco-friendly, and cruelty-free ingredients�so it's as sweet on the planet as it is tasty, and it's so easy to make that even a four year-old can do it! 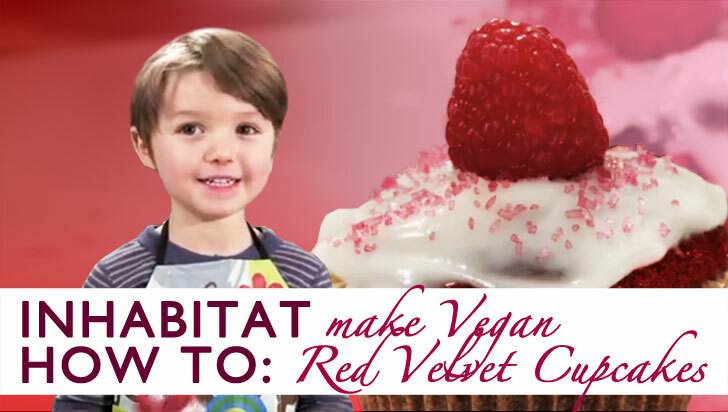 Watch the above video to see Inhabitots baker-in-training-pants, Petey Rojas, show you how to make vegan red velvet cupcakes. Read below to see the ingredient list and further details.